We would like to thank all who have left comments on the sit. And I would like to inform you that at this time any one can leave a comment. While at the embassy in Delhi we found out that the Taj Mahal is closed on Fridays, we decided to go to agra early any way, and see the Taj Mahal the next day. We left the hotel at 9:00 am and got stuck in traffic again on the way out. Along the way we stopped at a coffee shop in a mall on the main road about 50 Km from Agra mainly because we have a coffee addict amongst us who needs to have his caffeine. We continued until we reach Agra, and started to look for a hotel, we finally went with the Trident Hotel which was quit nice considering the price, and the service was top rate. That night there was a Thunderstorm, that rolled in, and at the time we were grateful we had finished riding for the day. We decided to get up early so that we can make it to the Kuwait embassy before they closed. we managed to leave at 8:30 am in the direction of Delhi with nice weather most of the way through. while passing one of the towns we made the mistake of not taking the overpass road, and ended up in mid traffic. The problem is that once you are stuck in traffic the temperature starts to increase rapidly both for bike and rider. It took us a good hour to reach the embassy from the outskirts of Delhi, at first we relied on people giving us direction, then we hired a taxi to show us the way , except he didn't know exactly were the embassy was , and got us in the general location where by accident we met an Indian on a small bike who worked at he embassy and showed us the way. After coordinating with the shipping agent last night I had all the passports and Carnets ready for him to pick them up in the morning. We relaxed that morning, and I worked on some videos for the blog. We were in direct contact with the Kuwaiti Ambassador in Islamabad Mr. Aziz Al-Dehani, who sent us a driver to the embassy where we met the ambassador and his staff discussing the events of our trip and plans. 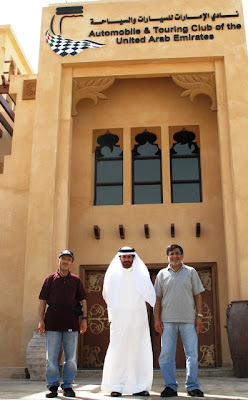 The Ambassador was so generous that he invited us for lunch, where we felt the core of Kuwaiti hospitality. At this time the team would like to Thank the Ambassador, and his staff for their full support. After lunch we left for the hotel and waited, around 5 pm the bikes arrived each on a truck still in it's crate, we then saw how 5 men hand carried the bikes from the trucks to the parking lot. 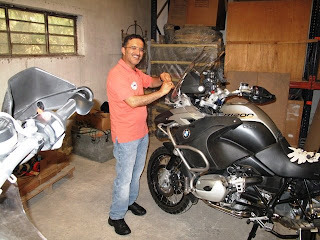 The services from the shipping agent here in Islamabad was top rate the carnets were given back all stamped, and we spent the rest of the afternoon preparing the bikes for our departure the next day. Some have asked me about the videos while riding, and I wanted to inform all of our helmet cameras. It took me a few months to find the right camera since most had a low resolution, and Husain wanted to make a DVD of our trip once we finished. The camera we are using is the V.I.O. POV Moto kit which gives a max resolution of 720 X 480. It also has a hard plastic cover to protect the glass lens from sand , and stones. 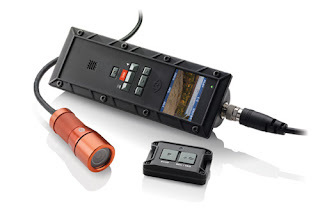 It can run on 4 AA batteries, and can be connected directly to a 12V car or bike battery. It also has a built in microphone for sound. We are eager to continue our adventure, and have booked a flight to Islamabad on Saturday the 23rd of May, our plan is to finish the customs clearance on Monday, and leave for India on Tuesday, were the temperature is around 40 Deg.We were also invited to a Mexican restaurant for lunch by a Mexican friend of mine who is living in Dubai. Salvador treated us to the Maya restaurant in Le Royal Meridian hotel. Although the food was excellent we were the only ones in the restaurant. We finally received the bill from the shipping company and as I suspected the difference between my bike and the other was 146 KD due to the extra space from the poor crating. 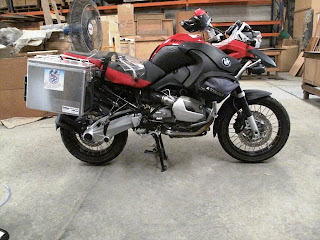 It was at this time that we decided not to use the same shipping company for shipping our bikes form Beijing to Alaska. Although we were told that at 8:30 the crew would work on crating the motorcycles, and that it would take only one to two hours to finalize the shipping we noticed that they didn’t know exactly what they were doing even though on the first day when we spoke to them we explained what needed to be done. We received a phone call from the shipping company stating that the crating will start at 10:30, and that their initial attempt at crating was week, and they needed to get bigger pieces of wood to insure that it could handle the load. We arrived at 10:30, and there was no one there, we waited for 20 minutes making phone calls until the supervisor showed up and another 40 minutes until the crating crew with the wood made it into the hanger. We then realized that they intended to use steel belting to fasten the bikes to the crates, as Ali put it "They think they are crating fruits?". Once we explained that they needed to have proper tie down belts, and where to put them, they had a better idea. We decided to leave them and come back in a couple hours since it was time for prayer and lunch. When we got there we found one motorcycle (Mine) already crated, I also realized that there was at least 20 cm of space between the steering bar the top of the crate which is dead space that they were going to charge me for it. After a lengthy discussion they agreed to minimize the space for the other bikes and not touch the one they finished since it was already mid afternoon, and they needed to send the bikes to the airport for the freezing period before the flight. We also noticed that the fan in the workshop was working fine for the crating crew, however when we were working on our bikes we were told it was not working. After making sure that the other bikes were properly strapped in we left for the hotel for a well deserved rest praying that the bikes would make it on time in one piece. It is the third day and the bikes are still not crated we were initially told that they would be working today but after we sent all our updated papers to the shipping office here in Dubai we noticed nothing was touched, we then were told that they have taken the measurements and will prepared the packaging tomorrow. I sent an email to complain about the delay in packing, and was given an unsatisfactory reason that the change is destination was the reason, HUH…..it was still going to leave, and still needed to be crated! At least we had a tentative date for shipping which was Friday the 22nd of May. 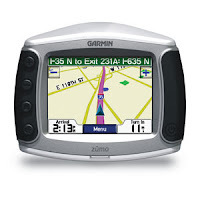 In the mean time Abdulla, Ali's brother arrived in Dubai, and delivered the Garmin Zumo 550s we were promised by the Seas and Deserts Company in Kuwait, and I started loading the maps in preparation for our next journey. We were just about to leave to see the crating of the motorcycles, and to deliver the required documents to the shipping company, when I received a phone call from the shipping agent in Kuwait informing me that India has banned the Air-freighting of Motorcycles, and that the only way to ship was through sea-freight. This would delay our trip another 15 days which was undesirable and unacceptable, so we asked if the bikes can be shipped to Islamabad. 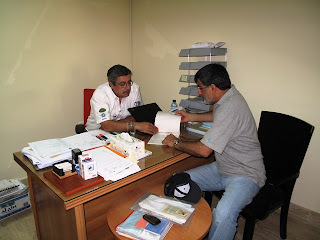 We also realized that when we prepared our Carnet (KT) we didn’t include Pakistan since there was a fee to be paid, and we didn’t intend to visit, so Ali made some phone calls and realized that we needed to visit the Automobile & Touring Club here is Dubai to get the Carnet approved for use in Pakistan. 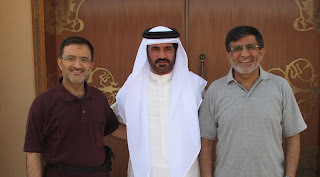 While I was busy working on updating our blog Ali and Husain met Mr. Adel Kassem who was very helpful in dealing with the Kuwait Auto Club, and took them to meet H.E. Mohammed Ben Sulayem the former rally Champion who was now the Chairman of the Auto club who expressed a genuine interest in our trip. We finally managed to get the Caret approved for Pakistan and we wanted to express our gratitude to wards Mr. Kassem for his support. After getting up all sore from the long ride the day before, we contacted the shipping company and rode our bikes to their warehouse where we started to prepare the bikes for crating. We needed to minimize the volume to reduce the cost of shipping, so we removed the mirrors, windshield, and top box, we also moved the CB radio as well as the GPC bracket. 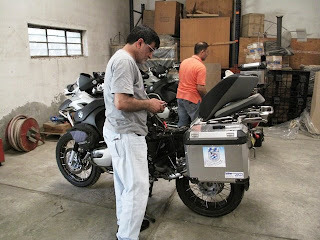 We also removed the battery and stored it in the panniers. The warehouse was hot with no wind draft, not even a working fan. By the time we finished we were exhausted and left the warehouse for the Hotel. We also found out that there was some miscommunication regarding the shipping since the shipping company was under the impression that we were going to clear the bikes customs our selves. We managed to get that sorted out and expected to see the motorcycles being put in crates the next day.